Discussion in 'Get Help/Troubleshooting' started by MegaFreeman, May 1, 2017. 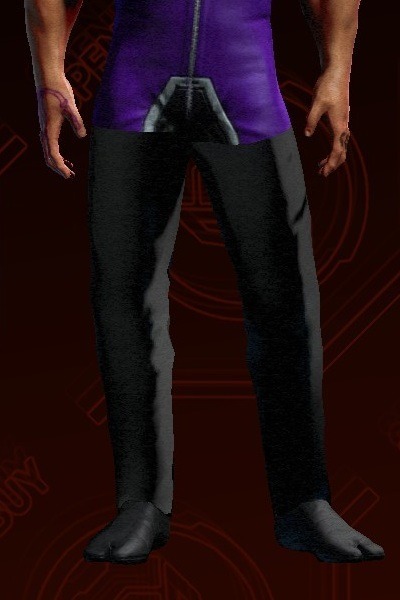 I am trying my hand at retexturing a cloned item in Saints Row IV and I am experiencing this problem where it shows in-game only the top part of the outfit as reskinned while the bottom part is grey. The suit is divided into lower and upper part. While the upper part is working fine, I do not see why would this happen to the down part considering I edited them the exact same way. You might want to try editing the original suit's files and see if it works there. Sometimes the cloning tool screws up the shading on cloned items. If that is the case you can just rename the files in the original's .str_pc to the cloned item's file names and repack them. Basically, do what @JigglyGruff said, but let me go into a little more detail. I'm assuming you have Minimaul's tools installed. Drag and drop the STR2 files generated by the clone tool onto ThomasJepp.SaintsRow.ExtractPackfile.exe and you should get two new folders in your mod's directory - one containing the assets for the male version and one containing the assets for the female versions. Both folders will contain a *.ccmesh_pc file. That's what you have to replace with the source item's file. To get your source item's file, first look up the associated mesh file with Saints Row Mods File Search. On that site, set the game to Saints Row IV and enter the mesh filename in your source item's customization_items.xtbl entry (without the extension). For example, the item "cm_suit_m_spacesuit" has a <Male_Mesh_Filename> tag, that contains a <Filename> tag. After that comes the text you want to copy, in my case cm_suit_m_spacesuitx.cmeshx, without the extension (".cmeshx"), so I'd just write "cm_suit_m_spacesuitx" into the file search form. In the search results, look out for the "Character mesh (CPU)" file and note the Parent Package as well as the Package Name. Now open Saints Row IV's archive directory (...\Steam\SteamApps\common\Saints Row IV\packfiles\pc\cache) and find the parent package you got from the file search (customize_item.vpp_pc). Drag and drop that file on ThomasJepp.SaintsRow.ExtractPackfile.exe and a new folder with the extracted contents should be created in SRIV's archive directory. Now open that folder, find the STR2 files with the name that match your package name (one will have an extra 'f' in the name, that's the file for the female assets). After you found custmesh_xxxxxxx.str2_pc and custmesh_xxxxxxxf.str2_pc, extract them just like you extracted your mod's STR2s. Open the source item's custmesh_xxxxxx folder, rename the cm_*.ccmesh_pc to have the same name as the cm_*.ccmesh_pc in your mod's custmesh_xxxxxx folder, then replace your mod's cm_*.ccmesh_pc with the source item's cm_*.ccmesh_pc. Open the source item's custmesh_xxxxxxf folder, rename the cf_*.ccmesh_pc to have the same name as the cf_*.ccmesh_pc in your mod's custmesh_xxxxxxf folder, then replace your mod's cf_*.ccmesh_pc with the source item's cf_*.ccmesh_pc. Finally, rebuild your mod's STR2_pc files. In order to do that, open ThomasJepp.SaintsRow.BuildPackfileGUI.exe, write the path to your mod's extracted custmesh_xxxxx.str2_pc folder into the "Source files" text box, check "Update asm_pc file?" and write the path to your mod's customize_item.asm_pc into the text box next to it. Click "Build" and replace your mod's existing custmesh_xxxxx.str2_pc file. Then write the path to your mod's extracted custmesh_xxxxxf.str2_pc folder into the "Source files" text box, check "Update asm_pc file?" and write the path to your mod's customize_item.asm_pc into the text box next to it. Click "Build" and replace your mod's existing custmesh_xxxxxf.str2_pc file. Now you can update your mod files using the Workshop upload tool. Could maybe the xxxx_pc.cmorph_pc be the problem? Oops, sorry, I forgot to mention you have to replace your mod's cpeg and gpeg files with the source item's cpeg and gpeg files as well. Those peg files contain the actual texture data you're missing right now. By the way, the cmorph has nothing to do with textures/materials, it just contains geometry data for morph targets.